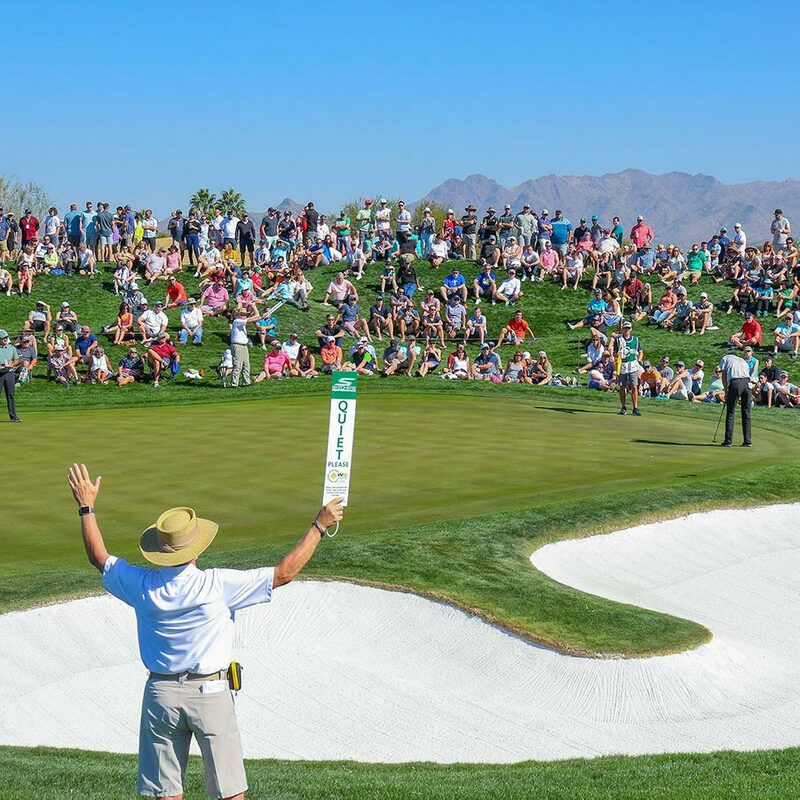 The Thunderbirds and Waste Management Phoenix Open achieve their charitable goals with the contribution of thousands of volunteers participating in a variety of roles. Volunteering during tournament week is not only a great way to be a part of the “Greatest Show on Grass”, but it has a direct impact on the amount of charity dollars Thunderbirds Charities pours back into the community each year. A volunteer’s responsibilities are fairly simple – show up for the shifts you’ve been assigned to, perform the specific duties of your position, wear the required uniform and ensure spectators have as much fun as you do! Most of our volunteer committees have a solid list of volunteers that return each year. If you are interested in volunteering, watch for volunteer registrations to open to the public this Fall; each committee will open independently. Professionalism is of the utmost importance and we are always looking for new faces and personalities to enhance our team. Hole Marshals serve as tournament ambassadors on the course providing crowd control, keeping distractions to a minimum, locating and protecting errant golf balls and assisting in spectator and player/caddie safety. Hole Marshals are often asked to remind patrons of PGA TOUR policy like cell phones and camera use, as well as crowd noise during play. New volunteers to the working Marshal group will be trained in all areas of responsibility and will report to a Hole Captain who will assign them to various shifts during the tournament. This committee has a remarkable return rate so new opportunities are rare. All Hole Marshals must volunteer for a minimum of two tournament days, Thursday – Sunday. Marshals are required to wear a uniform (white WMPO polo shirt with tan or khaki pants, shorts, skorts or capris) and comfortable shoes, but no golf shoes. New Hole Marshals will be guided to an internet portal to register online; then, upon confirmation of an assignment to a hole by a Hole Captain, will receive further instructions and details about uniform purchases and shift requirements. Be amidst the action on the course! Concessions Volunteers take part in the energetic and fast-paced food and beverage venues around the TPC Stadium Course during tournament week. You’ll have the opportunity to immerse yourself into the extravaganza and the thousands of fans that make this event the growing success that it is. Volunteers can join this team to work in food stands located all around the TPC, providing friendly service, food and drinks to patrons. There is an opportunity to earn service hours for a charitable organization through the Concessions Committee such as Special Olympics, The Leukemia & Lymphoma Society, Boys & Girls Clubs of Greater Scottsdale, or Phoenix Panhellenic Association to name just a few. Register online and sign up with the charity of your choice, listed within a drop-down menu at time of registration. Shifts are 7 hours in length and duties include cash register operation, stock replenishment and drink dispensing. On a first come, first served basis you choose your day(s), and shift(s). Large groups needing assistance with scheduling should appoint a representative to work directly with a Committee Chair. Volunteers are assigned to their duty station upon check-in depending on weather and tournament conditions. Tan or khaki pants, shorts or skorts and comfortable shoes are the uniform prerequisites. The charitable organizations represented are permitted and encouraged to provide a wearable to their volunteers to spread the message about their cause while working their shift in the concessions area. Volunteers may be asked to serve in multiple stands during a shift, based on the flow of golf and patrons across the course. This is a great opportunity for adult singles, couples, families, and even larger groups/teams to serve together in an upbeat atmosphere. Security volunteers staff the entrance to various venues on and around the tournament course. Even though multiple security agencies are employed during tournament week it’s our Security volunteers who are the first and last point of contact for our guests experiencing the Waste Management Phoenix Open. 75 Volunteer Captains supervise the almost 1,100 Security volunteers in 15 different venues at the tournament. We are proud of our volunteer Security teams who extend professional courtesies to the PGA TOUR players as well as the patrons who come to watch. Many of our Captains have been volunteering for 20+ years, which demonstrates their dedication to The Thunderbirds and the “Greatest Show on Grass”. Effective communication skills and attention to detail are necessary. Duties may include providing information to spectators; familiarity with the required credentials for each venue entry point; and crowd control all around the TPC and at the main Clubhouse. Some special assignments may include escorting special guests to various venues, provide egress for the players off the course during bad weather or darkness as well as escorting players back on to the course, to resume play. Within the online registration you will see a list of the venue assignments to choose from; you can volunteer multiple days at multiple venues around the course. AGE REQUIREMENTS: 18 years or older. This assignment may require extended periods of standing or walking; a shift is defined as a whole day, 6:30 am to 4 pm. Security volunteers are asked to wear tan or khaki pants and be prepared for variable weather conditions; the cool morning air often turns into a hot day. A safety vest is issued to identify our volunteer security while at their assigned post. Volunteers chosen to work the tournament will be contacted by the Volunteer Committee Chairperson in the weeks leading up to the tournament to confirm shift schedules, discuss requirements, benefits and the responsibilities associated with working your assigned position. Thank you for volunteering and paying it forward through your time and effort!